Being touched is one of our basic needs. There is always room for the patient to respond in his own way during the session. It is good if the patient brings his attention to the places in his body where he can feel the effect. This form of attention can alleviate pain, especially in the case of pain. Juanita has developed her own unique approach through her years of experience in many massage techniques. Like no other she feels where pain points have attached themselves in your body and she will release them effectively so that the energy can flow freely again. Juanita is a certified masseuse and foot reflexologist and has also received numerous training in all kinds of bodywork. Massage stimulates blood circulation and activates the lymphatic drainage, so that waste products are discharged faster. The warm hands on your body alone stimulate the production of endorphins (substances that alleviate pain, eliminate stress, ...). Massage is wonderfully relaxing for body and soul. There is also a deeper effect on the abdominal area. In the umbilical region, stress, tension and negative emotions accumulate in such a way that they are difficult to process (digest) and eventually all other vital functions stagnate. Our organ system therefore holds many unprocessed issues and repressed emotions; this technique helps to release diseased energy and blockages in the organs / intestines. During the disconnection of the various tissue structures and their connections, poor passages, acidifications are eliminated and we get a better flow. Out of respect, the untreated parts are covered. Your feet carry you all day and do not always get the attention they deserve. You can treat your whole body through the feet. This is an old massage technique in which pressure is exerted on the reflex zones that lie on the foot in order to generate reactions in corresponding parts of the body, to dissipate waste more quickly, to absorb nutrients better. Blockages in the body that cause all kinds of complaints (disturbance in the energy flow eg headache, stomach pain, depression, ...) can be lifted and as such be adjusted in a gentle way. Juanita will during a first consultation eg your feet / body mapping ie the pain points do feel so that you are more conscious on your feet or in your body. A good flow allows a stronger grounding. Depending on the complaints and findings about the bodywork, a follow-up plan can be drawn up. The self healing system is activated and tries to restore the balance. The entire person is always looked at and not only symptomatic. The cause of the problem is sought in order to achieve a lasting result. What does Foot Reflexology do? The design of the session is determined during the introductory conversation. Together with the patient it is determined which treatment 'here and now' is the most benefit and will best contribute to a positive continuation of his / her path. Juanita uses her scientific knowledge of massaging as a substructure but will soon move on to an Intuitive massage, which is a holistic way of massaging. The massage is created from the heart. Which will always be different. As a result, the hands are automatically controlled and this creates an alchemy between Juanita and the patient. With respect for your limits, let yourself touch! The 'Body Touch' does not only affect the body. Juanita also works with your energy body, blockades, voice, song, dance, movement, ... in short; a complete Body Touch of the soul. The treatment can start with a short massage and perhaps end with a liberating voice discovery. 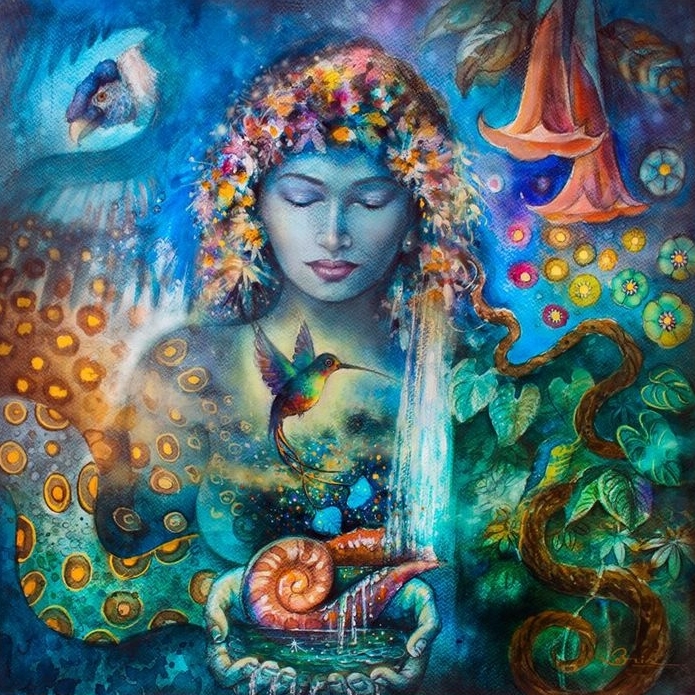 Juanita also uses her years of experience in Peruvian Shamanism as an undertone. In this treatment or workshop we invite you to question yourself, based on your body language and attitude, we use a deck of cards to interpret your own universe. This deck of cards contains 22 Hebrew letters, which in turn relate to essential questions of life, to dive deeper into your being. This is a unique opportunity to understand your way of life better, as well as your attitude and karmic relationships. "The 22 Hebrew letters in this deck act as 22 possibilities for growth, 22 symbols, 22 characters with complex characteristics. Taken from the Jewish tradition for whom these letters encompass their entire world. These Letters can bring us back to the source, our core and can create a new universe. " Bio Kabbalah is based on both the meta-biological functioning of man and the art of revealing the deep meaning of life through the 22 Hebrew letters. This method is inspired by the 'Terufah', the wisdom of healing and compassion to give the other what he really needs. With this approach you can give more meaning to your life, transform the darkness and gain access to your inner joy. BodyTouch is a subtle but deep and dynamic touch of internal organs. The vital systems of the body and meridians that respect our sacred geometry and the movements of the natural rhythms of life (5 elements of Chinese medicine) are triggerd, in order to achieve a greater vitality, purification and a harmonious transformation of our total being. By using BodyTouch in combination with reading these 22 Hebrew letters, there is a chance to feel more deeply, understand and thus integrate. A intuitive body approach that is intuitively done by Juanita, surrounded by sounds, music, and "shamanic Body Touch" through the entire process. These sessions are accompanied by Juanita Pyl en Deborah Waknine. You can book a private session or small group session. She has been trained in the decoding of syndromes, in counselling on palliative care and in the use of various body care techniques. She was also initiated by a shaman for several years. Learning the wisdom and symbolism of the 22 Hebrew letters through the teachings of Kabbalah to bring it into a considerable dimension to the infinite healing resources that we all possess. In her workshops and consultations, with the support of the Hebrew typeface, Deborah conveys the essential question that, in a reciprocal dynamic, can provide keys to growth into our true nature. In constant search for self-development, Déborah discerns a "Body Touch" method with deep, dynamic and subtle touches of internal organs, of vital systems of the body and of meridians, which respect our sacred geometry with the aim of bringing more vitality, and resulting in a purification and a harmonious transformation of our being. "I would like to guide you through this process to realize the encounter with your true nature"
Deborah Waknine gives workshops in Europe and Canada on topics such as "Bio Kabbalah", "Body Touch" the game "The 22 life sparks", and "The keys to autonomy".